Be captivated by God’s powerful love as K.P. Yohannan leads you on a journey through the slums and villages of Asia and into the hearts and lives of these precious children. An illiterate man came with a strange request to the leader of a GFA-supported Bridge of Hope center. Would they send the “medical doctor named Jesus” to help his sick wife? He was dead serious and quite desperate in his pleading. Here is the story. In this Bridge of Hope center, a first grader named Nibun was getting the opportunity to receive an education in mathematics, reading and writing. He also heard stories about how Jesus healed the sick, cast out demons and fed the hungry . . . 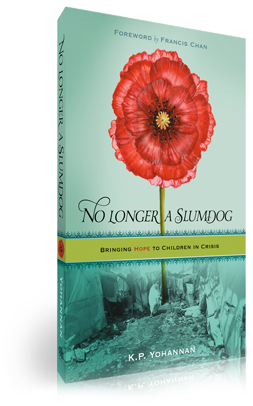 I just read your book No Longer A Slumdog and my heart was broken for the children of Asia . . . I've wanted to sponsor a child through some organization for some time. I had a friend post a link on Facebook to receive the book, No Longer A Slumdog. I ordered the book and now, here I am! Making a difference!!! As I read No Longer A Slumdog, I realized I can not turn my head and do nothing. Before I was ignorant to the truth of these tragic conditions, but now I pray daily and am so grateful for the blessings in my life. I recently received and read No Longer A Slumdog and was inspired to sponsor a child to go to school . . . I now feel that I have my first daughter and being that I aspire to become a mother one day and be able to share God with my children, this opportunity feels heaven sent. I ordered your free copy of No Longer A Slumdog. It came and I waited to read it for some time. Tonight I read it. Almost the entire book. I could see my own two children (6 and 4) as I read. I just wept. My family will be part of the difference in these children's lives. We won’t wait anymore.